Salto Gymnastics prides itself on accommodating programs from our local community to visit our facility and try gymnastics. Group bookings are a great way for school groups, churches, youth groups, homeschool families, and business teams to try something new while enjoying physical activity. Contact our Group Bookings Coordinator and Recreation Director, Tana Arcand today by emailing tarcand@saltogymnastics.com . Tana will get back to you within two business days. 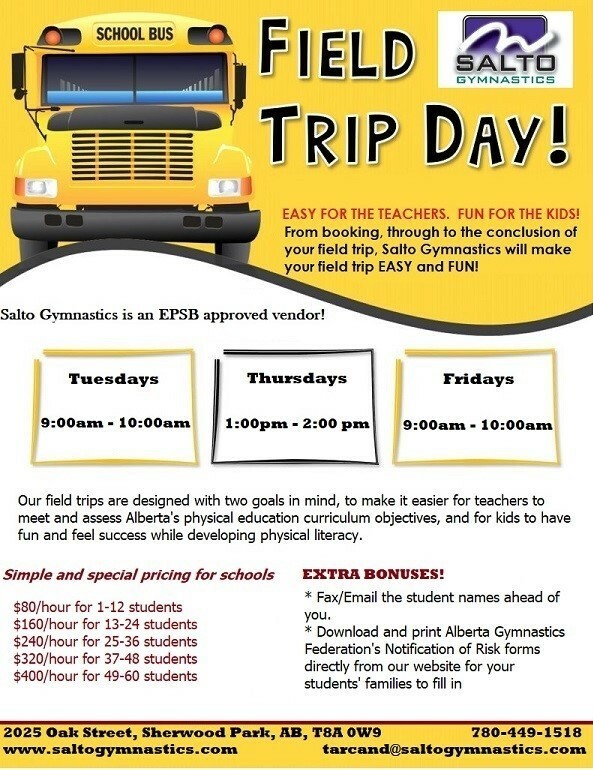 Salto Gymnastics is an approved vendor with Edmonton Public Schools. Salto hosts birthday parties on Sundays starting at 2:00pm for up to 20 participants! Birthday Party Package includes 1.5 hours of gymnastics for up to 20 participants, with coach and One Free Admission to a Salto Drop In for the birthday child. *$195.00 = Package includes "Up to 20 guests" gymnasium only. Parties may be sharing the gymnasium with other groups. **All Birthday Party participants MUST hand in our parent-signed Notification of Risk form and PIPA form at the beginning of the Party. These forms can be picked up at the gym or downloaded here. We require payment in full at the time of booking. Adjustments or refunds can be made ONLY with more than 14 days in advance. Contact our Birthday Party Coordinator and Recreation Director, Tana Arcand today by emailing tarcand@saltogymnastics.com . Tana will get back to you within two business days.